Tomorrow, July 18, 2014, is the 25th anniversary of the death of Rebecca Schaeffer. Schaeffer was a 21-year-old Hollywood actress and model who was gunned down in the doorway of her apartment by a crazed stalker. She died of a fatal gunshot wound to the chest. Schaeffer starred in the 1980s sitcom My Sister Sam (fall 1986 to Spring 1988) alongside Pam Dawber of Mork and Mindy fame. Her death rocked not only Hollywood, but her young fans including me. I remember feeling so devastated for her parents because she was their only child. Schaeffer and I were practically the same age. We were both born in 1967 just a few weeks apart. I have never forgotten her or her extraordinary smile. She will always be remembered as one of the first Generation X icons we lost when we were still young. In 2009, an online tribute, Missing Rebecca Schaeffer, was created in recognition of the 20th anniversary of her death. The site includes rare pictures of the actress with her family as well as some of Schaeffer’s thoughtful poetry. 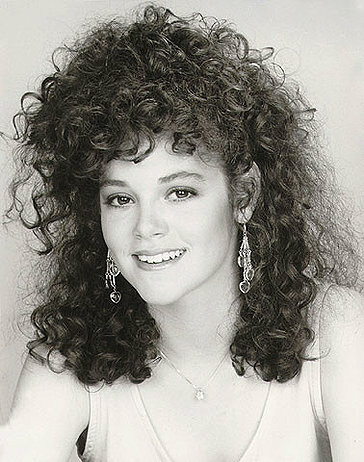 I thought Rebecca Schaeffer was absolutely gorgeous. I loved her giant mound of brown curly hair. An entire generation of girls tried to emulate her look. Here was my attempt. 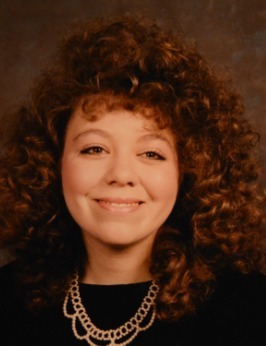 This was my college senior picture taken in September 1988. When it comes to Schaeffer, I can’t help but wonder what might have been had she lived. Life is unpredictable and all of our days are numbered. One thing is for certain; Schaeffer did not die in vain. Her death resulted in anti-stalking laws that protect famous people today. Read the Associated Press article distributed earlier this week: Stars Safer Because of Actress’ Murder. In closing, here is a poem Schaeffer wrote less than a year before she died. while is far more powerful. Man, I remember her. During this time, I was very close w/my older sister Tami and we felt a connection to this show and the sister relationship shared by Schaeffer & Pam Dawber. Our own relationship changed irrevocably because of a brain injury sustained by my sister in a car accident, which happened not long before Schaeffer’s senseless death. Those two events are forever linked for me.